Aeration makes Koi healthy, and needn’t be a chore. Just add air – the energy-free way. What is a pond venturi? Why have a venturi in a fish pond? 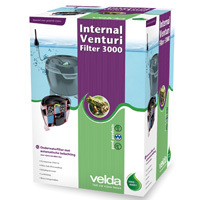 DIY or off the shelf venturi for your fish pond? Koi keepers owe a lot to Mr Venturi, but he’d be surprised at some of the uses put to his device these days. Over 200 years ago he discovered that fluid flowing through an open-ended tube with a central constriction resulted in pressure differences between the end and the centre of the tube. He used the device to measure flow. Aviators use it to measure plane speeds, and Koi keepers use it to add air to the pond water. As water flows through a venturi, the pressure drops in the restricted area, and if an inlet is fitted to this area, liquids or gases are drawn in. So long as you ensure that the inlet is unobstructed, air will be drawn into the water. The beauty of this being that all you need is a flow of water – no wires, electricity, or pump to go wrong or add expense. The bubbles in the water flow cause disturbance on re-entering the pond, creating a greater surface area of water available for absorbing oxygen and dispelling noxious gases. 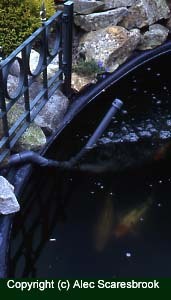 You can never have too much air in a Koi pond, it is necessary for the fish and the filter bacteria to thrive. Koi need more oxygen than other ornamental fish, and also produce far more waste. The fishes’ waste must decompose into harmless substances, so the beneficial filter bacteria need as much oxygen as possible to process this waste. In fact, it’s been calculated that 90 per cent of the oxygen content of pond water is used by these bacteria, so you can see why Koi keepers have to be constantly replenishing their systems. In addition to their aerating properties, venturis circulate water in the pond, providing a gentle current for Koi to exercise against. Venturis also direct sunken debris to one area. Their low price and free running costs put venturis at the top of the aerator list when it comes to economy and value for money. Venturis also have the edge over other aerating systems because they don’t rely on equipment that’s susceptible to winter damage. You can run a venturi all year – although in winter think carefully about the problem of adversely cooling the water. It all depends on your system – if you don’t provide winter heating, your Koi will move to the relatively warmer depths and survive in a stupor. Both the Koi and the filter bacteria need very little oxygen in this state and it’s best if the warmer layer of water is left undisturbed. If you heat the water during winter your Koi will be active, and so will the bacteria in the filters, so oxygen demand will be on the high side, causing you to consider your options. DIY fans can fit a T-piece into a pipe of larger diameter to obtain the pressure drop; others can invest a little of their money in more cunningly designed devices from various manufacturers. Some devices offer different nozzle sizes to suit different flow rates. Some devices will work with a gravity feed, whereas others need a pumped flow. So it all depends on your existing setup. Make sure you do your homework too – ask other Koi keepers and dealers which makes they prefer, and why. To monitor effectiveness and for peace of mind, it’s essential to use an oxygen test kit regularly as well. Don’t wait for your Koi to exhibit signs of oxygen shortage, but measure frequently so that you modify your set-up before your fish become stressed and vulnerable to pests and diseases, and your filter bacteria cease to be as efficient. There is only one thing that needs doing to maintain your venturi and that is to clear it of any blockages, should they arise. Insects, microbial growth and limescale are three potential blockers of aeration holes, and limescale build-up will eventually prevent the possibility of dismantling equipment for cleaning. To avoid problems with blockages, it’s a good idea to clean the airway and water pipe regularly, plus the air inlet filter, if one is fitted. Talk to other Koi keepers (individuals and dealers) to find out their own experiences of venturi design, installation and effectiveness. Choose a venturi fitting that has rounded edges to reduce the risk of your Koi harming themselves as they swim past. Choose a design that’s not vulnerable to blockages to ensure effectiveness and reduce time spent on maintenance. Look for ease of installation. A venturi that’s installed outside the pond makes the set-up and maintenance easy. Check that the device is suitable for inserting into either a gravity- or pump-fed flow, depending on your own set-up. Consider a venturi that can shut off (or devise your own method) to avoid removal of the venturi during winter. When setting up, don’t inflict too much back pressure on your pump, otherwise you could damage it. This is especially true if it’s a sump-type submersible pump. Avoid too many bends in the pipework before the venturi because this will create undesirable back pressure and reduce the effectiveness of your venturi. Be sure that the venturi won’t slow down the water flow excessively. Adjustable Venturis provide some flexibility and enable you to experiment with the set-up. If possible, trial your set-up before you stock the pond.